Holidaymakers planning a trip abroad from Stansted Airport over the bank holiday weekend might want to give extra consideration to their choice of travel insurance after baggage workers announced strike action. A total of 40 members of the GMB union are planning several two-and-a-half-hour strikes, at 3.30am and 3.30pm each day, from Friday August 23 until Tuesday August 27. This means that passengers will either have to travel light, with only cabin luggage, or face being delayed and possibly missing their flight. The union announced the series of strikes after the workers saw premium payments for working night shifts and other anti-social hours as well as overtime payments abolished to help finance a pay rise. An airport spokesman said: "We hope that we will be able to reach an agreement with the union, but if we can't full contingency plans will be put into place to ensure any disruption to passengers is kept to a minimum." 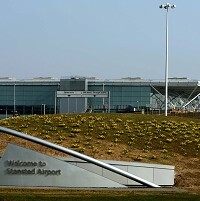 Contractor Stansted and Mitie, which is responsible for operating the baggage system at the airport, also said disruption would be kept to a minimum over the weekend. Talks with the union to bring an end to the conflict are reported to be taking place next week. GMB organiser Gary Pearce said passengers should prepare for severe disruption if the conflict is not resolved before the bank holiday weekend, as the Department for Transport needs to issue everyone who scans luggage with a licence - which means it will be tricky for the airport to hire short-term staff. Mr Pearce said Stansted and Mitie offered to increase wages by 2%, but scrapping the premium payments would effectively lead to a loss of 3%. He added: "Our members will have two stoppages of two and a half hours each, to avoid closing the check in desks for the whole day. When they do start work they will do their best to get the bags on the aircraft but there will be huge delays."